In Monkey Go Happy Marathon 2, you are going to cheer a sad monkey up. There are 15 scenes waiting for the players’ clicks. Each stage has puzzles or mini games that they should deal with. Like the game Monkey Go Happy, the players will click on any objects and areas on the screen in order to help this sad monkey solve his problems. The faster each round is finished, the higher score and bonuses they will gain. Although it will be harder than the Monkey Go Happy, but it is more exciting and challenging. Firstly, you ought to choose your own among four monkeys, and then select the suitable clothes for the chosen monkey. Next, the players will see a sheep standing in front of the door of the shed; the monkey wants to help this sheep to get access. Therefore, the door needs to be opened for the sheep. It’s funny because after entering the shed successfully, the appearance of the sheep will be changed surprisingly. If seeing a sad lonely boy, they will help him open his small bag and take a marker. After that, take out a piece of paper from a folder, put it onto school sign, and use the marker to write Bus Stop on. It seems that this monkey is naughty, but kind. In another situation, thanks to the strong supports from the players he is willing to assist an alien. They need to click the grass to make this alien come out, then catch him, put him into his spaceship, and finally close its lid. In case the monkey is eager to help a goat to jump over a hole, the clever players need to hide barbed wire in bushes. Then place the wire in the bush behind the goat to see what will happen. Another time, the monkey has a dream of shooting a cowboy’s hat, the gamers need to pick up a gun and shoot the cowboy’s hat before he shoots their monkey. There are a lot of available interesting scenes waiting for your discovery, the game pros! Hurry up and spend time on this funny and challenging journey now! 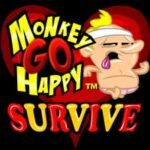 How to play Monkey Go Happy Marathon 2? The left button of mouse should be used. Monkey Go Happy Mini ..
Monkey Go Happy Marathon ..